NB: For this topic, perhaps the most researched in all of modern medicine, we are going to break up the answers to avoid dyspepsia. Our apologies for the extra emails. While the use of some anti-thrombotic agents in ACS is exceedingly standard–e.g., aspirin–that of others is much more variable. This is in part because of the ever-expanding drug development and research surrounding the care of the ACS patient. The ACC/AHA most recently updated its STEMI guidelines in 2009 and its UA/NSTEMI guidelines in 2011. Below is a summary of the latest recommendations (as well as some more recent updates) for STEMIs (PCI only) and NSTEMIs. Dual-antiplatelet therapy is recommended in STEMIs, with PCI or fibrinolysis. Aspirin 162 or 325mg (Class I, LOE A) should be given as soon as possible, as should either clopidogrel (Class I, LOE C) or prasugrel (Class I, LOE B) (the latter two being thienopyridines). If the thienopyridine is held until the coronary anatomy is elucidated via angiography in anticipation of possible need for CABG, it should be given as soon as PCI has been decided upon. While the recommended loading dose for prasugrel is set at 60mg, that of clopidogrel (300 v 600mg) remained unresolved as of the 2009 update. However, at least two trials since then (HORIZONS-AMI, CURRENT-OASIS 7) have both suggested that the higher dose of 600mg may be superior in PCI, though the benefit is possibly offset by an increase in major bleeding. As for which of these two thienopyridines to choose, the 2009 recommendations do not specifically endorse one over the other. Notably, prasugrel achieves greater inhibition of platelet aggregation, has a more rapid onset, and is not susceptible to the variable response in patients that clopidogrel is. In the pivotal prasugrel trial, TRITON-TIMI 38, prasugrel was associated with a significant absolute and relative reduction in composite rate of death due to cardiovascular causes, non-fatal MI. or non-fatal stroke relative to clopidogrel; however, the clopidogrel dose used was only 300mg (not 600mg). Prasugrel also had a greater risk of bleeding and was found to not have a net benefit in patients with a history of stroke or TIA, in patients over age 75, or those with a body weight less than 60kg. 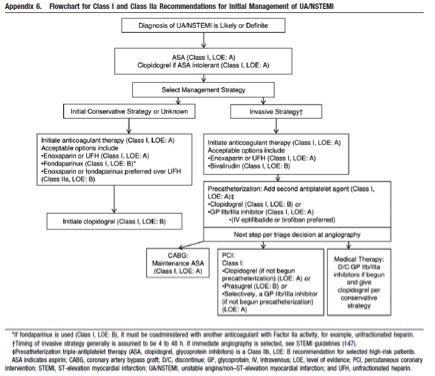 Consequently, the current recommendations are to avoid use of prasugrel in these patients. Of note, the 2009 recommendations do not discuss ticagrelor, a promising, reversible adensosine diphosphate receptor antagonist that was shown in the PLATO trial to have significantly reduced cardiac and all-cause mortality in patients, relative to clopidogrel, without an attendant increase in bleeding risk. This agent was FDA approved on July 20, 2011 and will likely be added to the recommended arsenal of ACS agents soon. Glycoprotein IIb/IIIa receptor antagonists (GPIs, e.g., abciximab, tirofiban, and eptifibatide) are another group of anti-platelet agents that have been amply shown to reduce recurrent ischemia and MI in ACS patients who undergo PCI (Boersma, 2002). However, there have not been many trials studying GPIs with current STEMI treatments, particularly in the era of dual anti-platelet therapy. The few that have looked at GPIs as adjuncts to oral antiplatelet therapy (BRAVE-3, On-TIME 2, HORIZONS-AMI) have found no difference in infarct size or thirty day mortality, and have found either no difference in bleeding or an increased risk of bleeding. 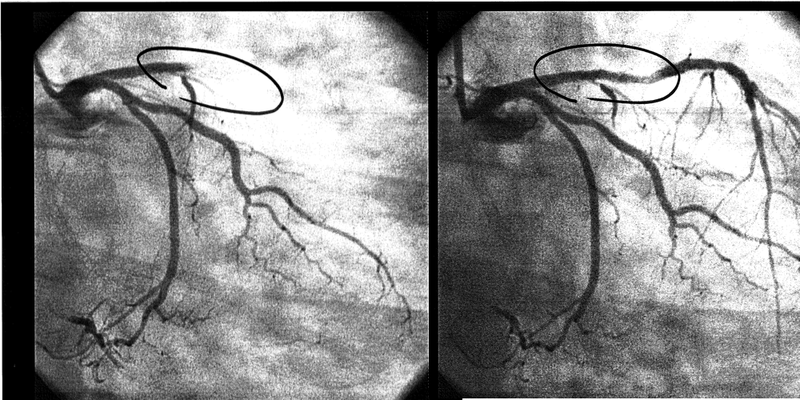 So, while the AHA still considers them to be a reasonable treatment at the time of PCI in selected patients (such as those with large thrombus burden or those not adequately loaded with thienopyridines), these agents have fallen out of favor as a pre-PCI or “upstream” intervention where they are associated with increased bleeding risk (FINESSE). This means that this class of drugs will primarily be administered in the cath lab and not in the ED for STEMIs being treated with primary PCI. Bivalirudin, a direct thrombin inhibitor, was added to the 2009 guidelines as a useful supportive measure for primary PCI, with or without prior treatment with UFH, for patients who had also received aspirin and a thienopyridine. It was also recommended for patients undergoing PCI who had a high risk of bleeding, as it was found to have a decreased bleeding risk associated with it. It is considered by some to be the preferred anticoagulant in primary PCI (Diez 2010, Wong 2011). In summary, patients with STEMIs who are heading to the cath lab should receive aspirin, either clopidogrel 600mg or prasugrel 60mg, and an anticoagulant–preferably enoxaparin or bivalirudin–while in the emergency department. Consultation with the cardiologists at your hospital is always prudent in making these decisions, as local practice may vary. Much as for STEMIs, dual antiplatelet therapy with aspirin and a thienopyridine is recommended for NSTEMIs. However, while the aspirin is to be administered immediately, the timing of the thienopyridine can be delayed until “as soon as possible after admission” for those patients being treated with medical management, according to the 2011 guidelines. For those undergoing an early invasive strategy, it should be administered before (or at the latest, during) PCI. Clopidogrel is the thienopyridine recommended in most circumstances, with the guideline updates allowing for prasugrel to be given only during (and not prior to) PCI for those NSTEMIs being treated with an invasive strategy. The reason for this was prasugrel’s high risk of bleeding, as discussed above. Ticagrelor will likely soon play a role in NSTEMI management as well, now that it has been FDA approved. The 2011 guidelines brought about a change in recommendations regarding GP IIa/IIIb inhibitors in NSTEMIs. Again, as with STEMIs, few trials exist examining GPIs in the setting of dual anti-platelet therapy. Two trials that have examined GPIs in the setting of aspirin/clopidogrel compared early and delayed administration of GPIs in UA/NSTEMI patients scheduled for PCI (EARLY ACS, ACUITY). Neither found a significant difference in their primary end points (all-cause mortality, MI, recurrent ischemia), but both noted significantly greater risk of major hemorrhage in the early GPI patients than the later GPI patients. These results were confirmed by a meta-analysis of studies evaluating early and delayed GPI use (De Luca, 2011). It is important to note, however, that these studies were done in moderate and high-risk patients scheduled for early invasive therapy, and hence their results may not apply to those UA/NSTEMI patients being treated with medical management. Nonetheless, the ACC/AHA guidelines recommend that the use of a GPI as part of triple anti-platelet therapy should only be undertaken when the risk-benefit ratio suggest a potential benefit for the ACS patient who is undergoing PCI. The guidelines do not recommend GPIs for patients being treated with medical management. Anticoagulation regimens for NSTEMI vary, depending on whether a medical management or early invasive strategy is being taken, and on the patient’s bleeding risk. If the patient is being treated with medical management, or the decision has not yet been made to pursue invasive interventions, then either enoxaparin or fondaparinux is recommended over UFH, in part for the reasons given above for STEMI. In addition, a Cochrane review of UFH versus placebo in ACS found no difference in mortality. While it did find a lower incidence in non-fatal MI in the first week after the initial ACS event, the benefit was no longer seen at thirty days, three, and six months (Magee, 2008). Enoxaparin has been found to be non-inferior, and likely superior, to UFH in preventing in-hospital death or MI (ACUTE II, A to Z trial). For patients undergoing early invasive therapy, UFH, enoxaparin or bivalirudin are acceptable agents. Of note, unlike in medical management of NSTEMI, at least one study (SYNERGY) has shown that in patients undergoing PCI, enoxaparin has a higher rate of bleeding than UFH, with similar rate of death or MI. Bivalirudin was found to be non-inferior to heparin/LMWH combined with a GPI, (especially when clopidogrel was given early versus after PCI), and had a significantly lower bleeding rate. Hence, it is considered a good option in NSTEMI patients undergoing PCI at high risk for bleeding complications (ACUITY).